This project was for sure a labor of love. I’m not going to tell you it was easy, because it took some hard work. But I will tell you how I did it and that it is very doable, and really pretty simple. I’m the type of person that when I get an idea in my head, I will not rest until it comes together EXACTLY the way I have envisioned. Now, I have had to learn some flexibility in some situations. 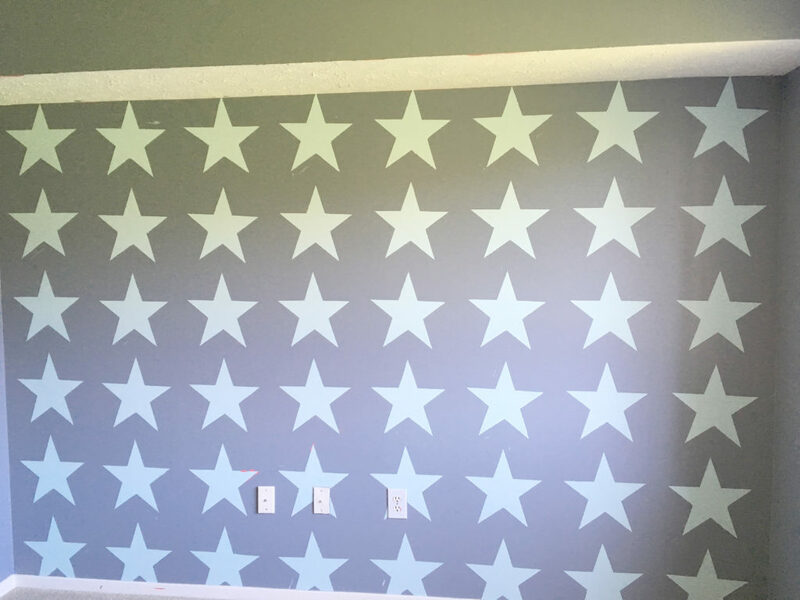 For instance, I originally wanted a light colored wall, with darker colored stars for this star accent wall in the kids room. That’s obviously not how it turned out, although I ended up very happy with the final result regardless. Paint is not the cheapest thing in the world, but if you want good quality, you usually have to bite the bullet and go for it. One way around this is to check out the discount paint shelf. We took a trip to Lowes in preparation for this project to see what we could find. The discount shelf is a bit of a gamble, and you may have to be willing to change your color choices based on what you find. We lucked out on this trip and found a gallon of gray semi-gloss wall paint and a pint of a really lovely mint green. These were perfect complimentary colors for our gender neutral, shared nursery. I had wanted to do a light color on the wall with some darker stars, but given the colors in the quantities we found, I had to change it up a little. 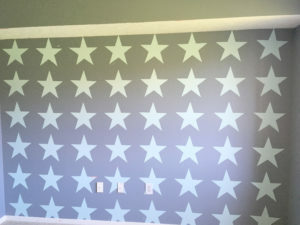 Thinking back, I’m not sure I would’ve liked an all mint room with gray stars anyway! Now we had the paint, how would we draw the stars? I searched google images for the star shape I found and will link it for you here. I actually found myself without a printer to print it to scale. Thankfully my husband is a great artist with a steady, precise hand and was able to free hand it for me. So whether your print it out or freehand it, make sure it’s on some card board or card stock, sturdy enough to trace onto your wall (I used the top of a cardboard shirt box I had in my gift wrap pile). You also need to decide how big you want your stars to be. I wanted mine to be 1′ x 1′ square. Because of the particular star I chose they weren’t exactly square, but pretty close. My star ended up being 12.25 x 12.5″. Next, you need to measure your wall. So grab a measuring tape and take down the height and width of the wall you are using as your “accent wall”. You’ll need to do a little math to figure out how many stars will fit across and up and down. I took my little stencil and eyeballed it first, holding it up and counting how many would go across. Then when I found a number that would fit in the space, I went back and measured how many inches I needed to allow between each star. For my wall, it ended up being about 3.5″. Here is the way the room looked before we began our makeover project. 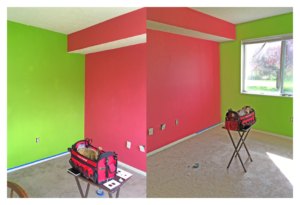 I mentioned in a previous blog post (part 1) what bright colors we used. The next two steps are the most tedious parts of the whole process. 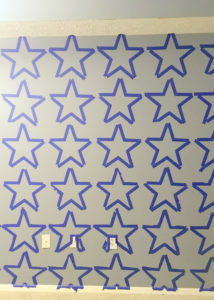 I took a pencil, measuring tape and my star stencil and went to work tracing stars across the whole wall. Having two young children, I usually had to wait until bedtime to get this done. I think in all, it probably took 2 full hours. Not too bad, really. I was just determined to get this done and have the end result the way I was envisioning it. So even though it seemed a bit of a daunting task at times, I would just take a deep breath and go for it. It was kind of therapeutic in a way, just very repetitive and quiet (once the kids were in bed, anyway!). In order to save time in measuring between each star, I cut out some painter’s tape in the same distance I wanted between the stars and just lined it up, and then moved it to measure from the next star, and so on. Much easier than getting out the measuring tape and making pencil marks each time. This gray color makes for a much more peaceful bedroom environment. Once ALL the stars are stenciled, you can start taping them off. This was a little tricky, just because there are SO many angles and corners. I would just go one straight side at a time, sometimes adding a bit here and there to make sure that the angles were sharp enough, once it would come time to paint them in. Next, I added the paint. I painted a couple of coats and it took me long enough after the first coat, that the ones I had painted first were ready for their second coat. It was kind of like when I paint my nails with two coats of polish…but on a much larger scale. Lol. I let that all sit overnight to ensure it was really good and dry. Finally, came my favorite part: peeling off the tape! It was so much fun to see those clean lines and all the pretty stars come into view. I didn’t do a perfect job. If you look closely you can see areas where the paint landed outside of the tape, or the edge became jagged because the tape allowed it to bleed a little bit. But overall, I was very happy with the result. In retrospect, maybe I should’ve removed the tape immediately? Some of the tape was tricky to remove and started to peel the new paint off with it. Maybe someone with more experience painting could tell me. If I wanted to, I could go back in with a small paint brush and clean up some of those areas. But right now I’m more of the mindset that “ain’t nobody got time fo dat.” Most of the problem areas are near the floor and hidden by furniture. If the perfectionist in you needs it to be perfect, by all means make it so! 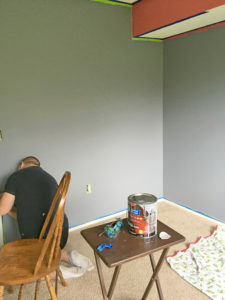 Paint the room all one color, using the paint roller. Measure the accent wall and determine how many stars are needed to fill the wall. Paint the stars in your second color, using the small paint brush. Peel back tape and enjoy the view! Touch up if needed. This technique could be used with any shape you want! You may even decide to use something like this as a border around the room, or around the perimeter of a wall, rather than one accent wall. It’s totally up to you! 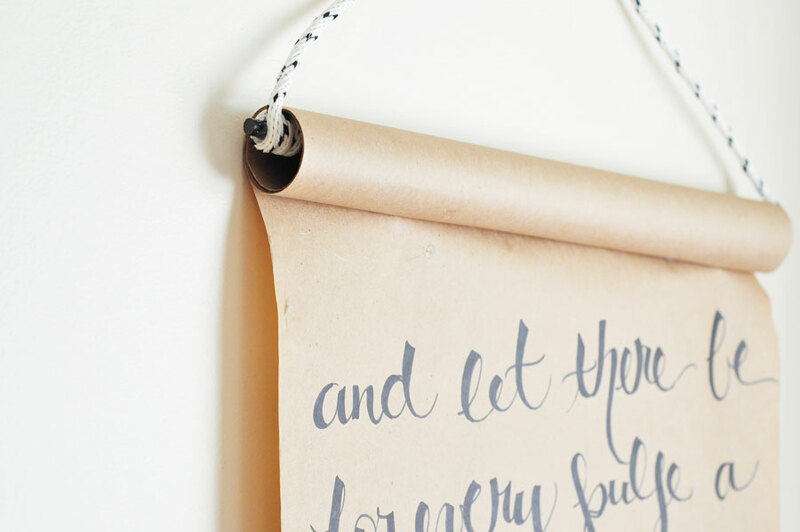 I hope these tips are clear enough that you can follow and create a cute little wall in your own home. Let me know if you have any questions! Happy decorating :-).